The analysts of Persistence Market Research have adopted a systematic research approach while examining the global gas masks market in a recently published report titled “Gas Masks Market: Global Industry Analysis and Forecast, 2016–2026.” The expert team of researchers have used in-depth secondary research to arrive at the overall market size, top industry players, top products and industry associations. Persistence Market Research has conducted interviews with industry experts, players, distributors and retailers. The analysts have noticed that the Asia Pacific regional market is expected to grow rapidly due to rapid industrialization in the region. Among all the regions, Latin America and Middle East regions are anticipated to hold small market share but are expected to grow moderately in the global gas masks market. After a detailed study of the global gas masks market, the analysts have further observed that Europe is the largest market in terms of revenue share. The report covers the developmental strategy and product innovation adopted by key players and highlights the vertical market approach. 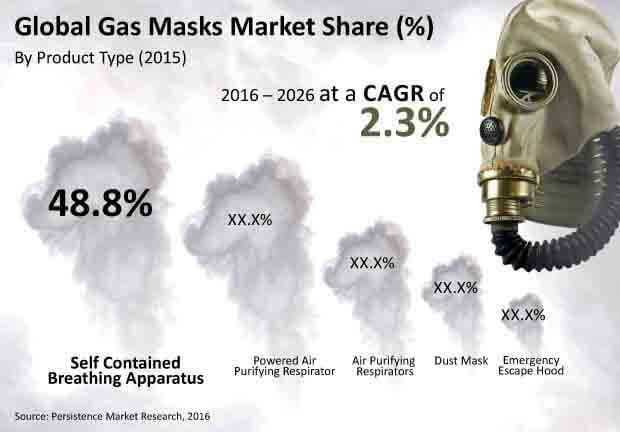 The analysts have further observed that acquisitions, mergers, and collaborations are key strategies adopted by various manufacturers to increase customer base in different geographies in the global gas masks market. This comprehensive report covers the growth rate projections and forecast factors of the global gas masks market. The report consists of the market introduction that includes market definition and taxonomy. The report also presents the overall market approach and underlines factors influencing the growth of the global gas masks market along with a detailing of the key trends, drivers, restraints, opportunities and regulations. Impact analysis of key regional growth drivers and restraints based on the weighted average model along with key region-specific trends has been included to better equip clients with information and hidden insights. Inflation rate has not been considered to arrive at market revenue at subsequent levels of market segmentation. The prices of gas masks have been tracked at the manufacturer level after conversion through trade websites and based on primary interviews. Growth in the industrial sector, defense and equipment, per capita income, purchasing power parity, GDP growth, health and safety products, oil and gas industry growth have been closely referred to arrive at the market forecast. Market splits have been deduced from surveys and primary research. At the end of the report, Persistence Market Research provides key strategic recommendations for both existing and new players in the global gas masks market to emerge sustainably profitable. The forecast presented in this report assesses the total revenue of the global gas masks market. When developing the market forecast, the starting point involves sizing the current market, which forms the basis for forecasting how the market is anticipated to take shape in the near future. The outcome is then triangulated on the basis of analysis based on supply and demand sides. The report also takes into consideration year-on-year growth to understand the predictability of the market and to identify the right opportunities across the global gas masks market. As previously highlighted, the market for global gas masks is split into various categories. All these segments have been analyzed in terms of Basis Point Share to understand individual segments’ relative contribution to market growth. This detailed information is important for the identification of various key trends in the global gas masks market. Powered air purifying respirators segment is expected to account for a major share in the global gas masks market during the predicted period. The powered air purifying respirators segment accounted for the second largest market value share of close to 40% in 2016 and is anticipated to gain more than 20 BPS over the forecast period. Revenue contribution of this segment is expected to increase with a CAGR of 2.1% over the forecast period. Powered air purifying respirators are primarily preferred by firefighters and governments across countries have increased the budget allocation of civic safety equipment procurement. Furthermore, respective agencies are also upgrading equipment, which in turn is boosting the demand for powered air purifying respirators. The market share of this segment is predicted to increase by a margin of 0.85% in 2026. The segment is likely to be valued more than US$ 900 Mn in 2017 and is projected to reach a market valuation in excess of US$ 1000 Mn by 2026. The powered air purifying respirators segment is estimated to create incremental opportunity of US$ 200 Mn between 2015 and 2026. Several regulations put in place by government bodies mandates employers to assess hazards at the workplace and provide workers with personal protective equipment including gas masks as required. Stringent regulations in conjunction with increasing preference towards providing safety at the workplace are driving the growth of the powered air purifying respirators segment. Employers are focusing on providing improved protection against the various encountered risks at the workplace. This has led to the development of new manufacturing technologies and materials. In line with this, in the recent past, the powered air purifying respirators segment has witnessed the introduction of several high technology innovative products that comply with prevalent industry standards. These high-quality cost-effective gas masks are expected to propel the growth of the powered air purifying respirators segment over the forecast period. Growing industrialization in emerging countries such as China and India is expected to fuel market demand in the powered air purifying respirators segment globally during the period of assessment. Sustained government support coupled with the increased outsourcing of manufacturing endeavors from developed nations has propelled industrialization in these emerging economies. With the increasing number of accidents, subsequent fatalities and injuries in mining, construction, oil and gas and chemical industries, adoption of personal protective equipment such as powered air purifying respirators for the labor workforce has become a critical requirement. Adoption of powered air purifying respirators in various industries not only significantly reduces injuries and fatalities but also increases productivity output. This factor is creating a positive impact on the powered air purifying respirators segment. The powered air purifying respirators segment is estimated to be the most attractive segment with a CAGR of 2.4% in North America, while in Europe the powered air purifying respirators segment of the global gas masks market is expected to reach a Compound Annual Growth Rate of 2.3% and is estimated to reach a little more than US$ 140 Mn by the end of the forecast period. In the Asia Pacific gas masks market, the powered air purifying respirators segment is expected to create incremental opportunity of more than US$ 60 Mn during 2016-2026. The segment is projected to be the most attractive segment with a CAGR of 2.5% and is anticipated to reach a market valuation close to US$ 90 Mn by the end of the forecast period in the MEA gas masks market.